Japan's defence ministry says it is seeking more funds for military spending, a day after news the government would boost the defence budget for the first time in 10 years. The ministry is asking for 180.5bn yen ($2.1bn, £1.3bn), some of which an official said would be spent on missile interceptors and fighter jets. The move comes with Japan embroiled in a territorial row with China. It also follows North Korea's recent successful long-range rocket launch. "We will request 180.5bn yen to be allocated to military spending from a stimulus package," a defence ministry spokesman told Agence-France Presse news agency. He said that part of it would fund the purchase of PAC-3 surface-to-air anti-ballistic missile systems and modernise four F-15 fighter jets. The defence ministry spokesman said the funds were needed "to prepare for the changing security environment surrounding Japan". The finance ministry has to approve the request before it can be added to the government stimulus package expected later this month. The request for funds is in addition to news on Tuesday that the new government, which won elections in December, would increase the defence budget request by more than 100bn yen. Officials say the increase would be used for research into a new radar system and maintenance costs for military aircraft. The mooted increase is not large - the defence budget for the year ending in March 2012 stood at 4.65 trillion yen - but it represents a change. 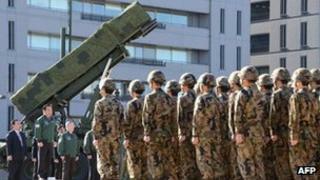 For 10 years, Japan's defence budget has been gradually declining. But in the last few months the country has been shaken from two sides, says the BBC's Rupert Wingfield-Hayes in Tokyo. In December, North Korea successfully launched a long-range rocket that flew over southern Japan. Much more worrying for Tokyo is China's push to claim disputed East China Sea islands, our correspondent adds. The dispute over the islands, called Senkaku in Japanese and Diaoyu in Chinese, has rumbled for years. Japan controls the islands but its purchase of three of them from their private Japanese owner in September sparked a renewed row. Since then Chinese ships have been sailing in and out of what Japan says are its territorial waters around the islands, prompting warnings from Tokyo. New Prime Minister Shinzo Abe, who is known as a conservative, has pledged a strong stance on the territorial issue while also calling for dialogue with China.